When a tooth is beyond repair due to disease or injury, it may be necessary to remove it. A “simple” tooth extraction is among the most common in dentistry and certainly not the agonizing procedure depicted in common lore. They’re referred to as simple extractions because the shape of the tooth and root allows for a fairly straightforward and uncomplicated removal. An example would be the normally cone-shaped upper front tooth that doesn’t offer a lot of resistance during the extraction process. The process itself is fairly straightforward. Teeth are held in place by the periodontal ligament, an elastic tissue made of tiny fibers that attaches the tooth to the supporting bone. These fibers can be dislodged from the tooth with some careful manipulation — in the hands of an experienced dentist there’s a deft “feel” to the fibers loosening. Once they’ve detached, it requires little effort to remove the tooth; with the aid of local anesthesia, you won’t feel anything but a little pressure. Immediately after the tooth is removed, we commonly insert bone grafting material in the socket to minimize bone loss until a permanent replacement like a dental implant can be installed after tissue healing. We then place sterile gauze over the site for a few minutes to control bleeding and, depending on the size of the wound opening, we may also place a few stitches to close it. We then give you instructions for caring and cleaning the site over the next few days, and prescribe antibiotics to reduce the chance of infection and anti-inflammatory drugs for any discomfort. 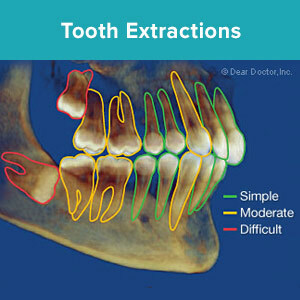 Although a simple extraction is a routine procedure, it’s important to perform a proper assessment of the tooth and the surrounding bone beforehand, including x-rays to determine the tooth’s exact shape and position. If we discover a complication that makes a simple extraction impractical (like multiple roots at acute angles), we may then refer you to an oral surgeon for a more complicated surgical extraction. It’s our hope you’ll have your natural teeth for as long as you live. But if you must have one removed, you can rest assured it’s a common — and uneventful — experience. Teeth crowding is a difficult bite problem (malocclusion) that often involves the entire jaw structure to be evaluated. Normally occurring when the jaw doesn’t have adequate space for normal tooth eruption, teeth coming in later put pressure on other teeth, causing them to develop improperly. Crowding also makes it difficult to realign teeth with braces because there’s simply not enough room for sufficient movement to take place. 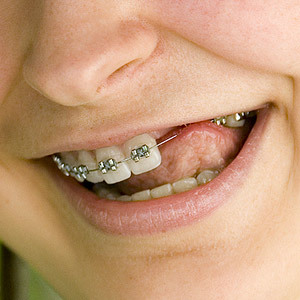 The solution may then be to consider the removal of some of the teeth to create enough space for orthodontic treatment. Not just any tooth can be removed, however — we must first conduct a careful analysis to determine which can be removed to facilitate optimum movement of the remaining teeth without disrupting normal mouth function or affecting appearance. The teeth most frequently removed for this purpose are the bicuspids, located between the cuspids or eyeteeth (which are positioned directly under the eyes) and the molars, the largest teeth in the back of the mouth. Sometimes one premolar tooth on each side of the jaw can be removed without sacrificing future form or function. There are a few important considerations we must keep in mind when extracting teeth for orthodontic reasons; perhaps the most important is preserving bone at the extraction site. Because continuing bone growth depends on the forces generated by teeth when we bite or chew, bone near a missing tooth socket will tend to diminish over time. If there’s insufficient bone during orthodontic treatment, it may result in gum recession and root exposure — not only damaging to the teeth themselves but also to a person’s smile appearance. To avoid this, we sometimes will consider inserting a bone graft, which will stimulate bone growth, into the empty socket immediately after extraction. While this isn’t commonly done, it’s being considered if the patient’s bone is thin and a concern during healing. We must also consider how to accommodate other, unrelated tooth loss to assure the final result is visually appealing. It may be necessary in these cases to maintain the space at the missing tooth site for a future restoration once the orthodontics is completed. This takes planning as well as the use of restorations like dental implants, bridges or partial dentures. Regardless of your bite issues, the field of orthodontics has the appliances and techniques to overcome even the most complicated condition. When necessary, using procedures like tooth extraction can help turn an unappealing, dysfunctional bite problem into a beautiful smile.